July 9-12, 2017. 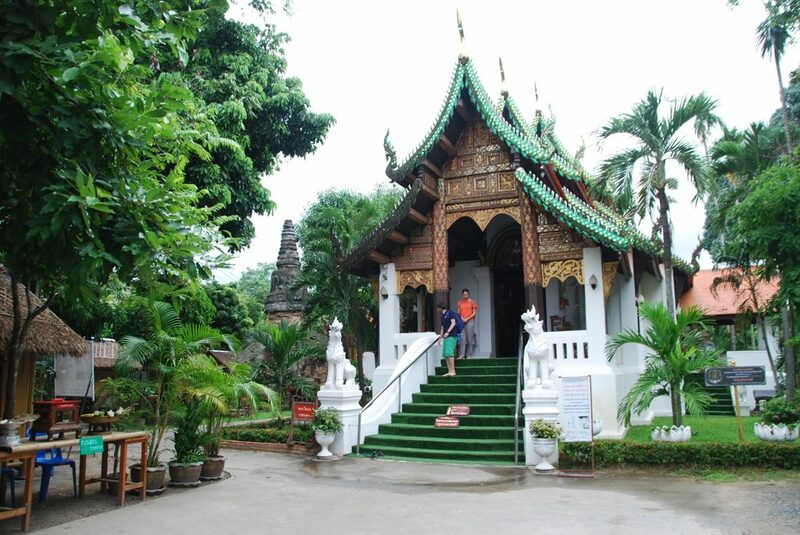 Thailand is our first stop. Arrive in Chiang Mai from Bangkok. We’re exhausted from our initial overseas travel and the early morning wake up calls that it took to get here. 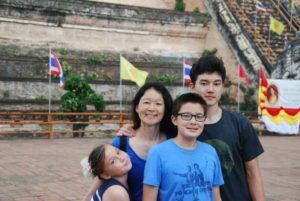 We flew from Osaka to Bangkok and arrived around 11pm. 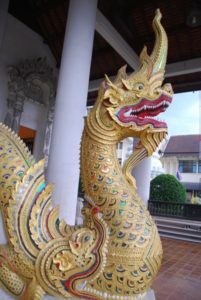 Then we got up early to fly to Chiang Mai. 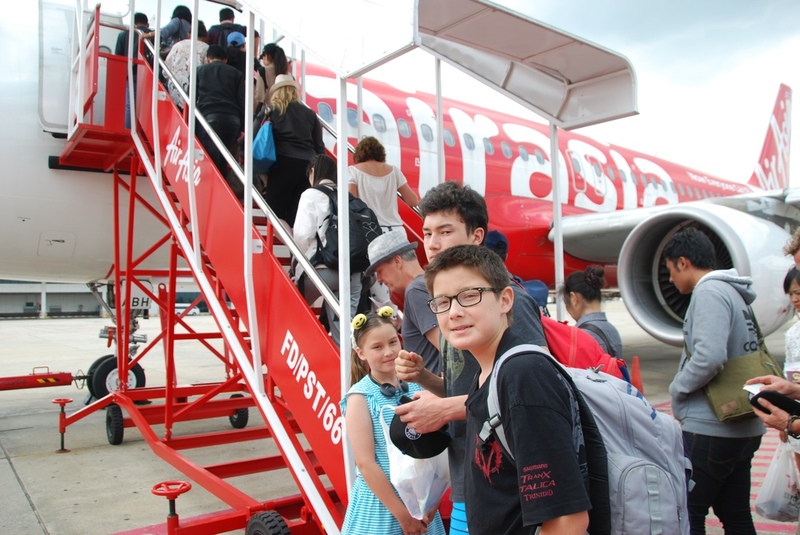 Here we are getting on the plane for the first of our many little hops around Southeast Asia. Before we moved here I thought using the stairway to get on the plane from the tarmac was so cool. But taking a hot bus from the airport gate to the plane, and then dragging luggage up the stairs isn’t fun anymore. We’ve done it too many times now! We’re finally settling down for 3 nights and it is going to be the longest that we stay at one hotel in our entire 2 week trip. 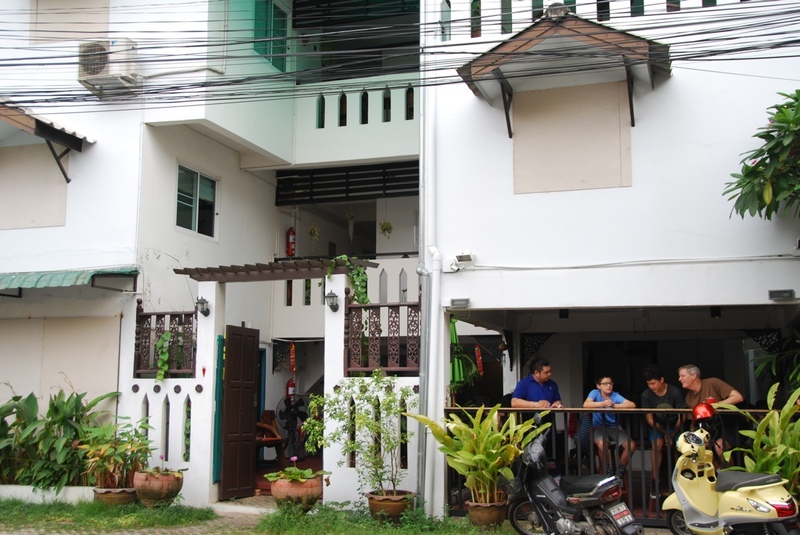 We’re at a local place called V Lodge that’s right in the city near the Old Quarter of Chiang Mai. 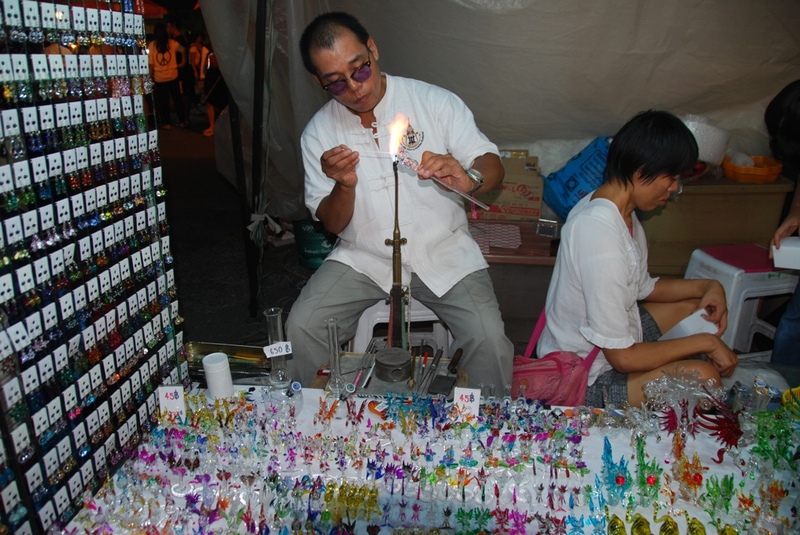 We’ve arrived just in time for the Sunday Walking Street, which is a night market that is open on Sundays from 5-midnight. Let’s see what bargains we can find! This man is making hand blown glass figurines right in his stall. They’re so detailed and colorful. There’s lots of fun things to look at while walking down the street. 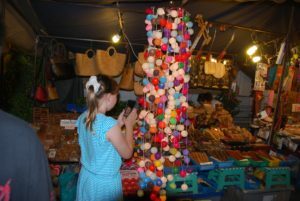 Hand carved wooden toys, lanterns, fans, shirts, skirts, bowls, ornaments, handbags, puzzles, food. Just about anything you can think of. Here is a photo of a stall selling mochi ice cream. 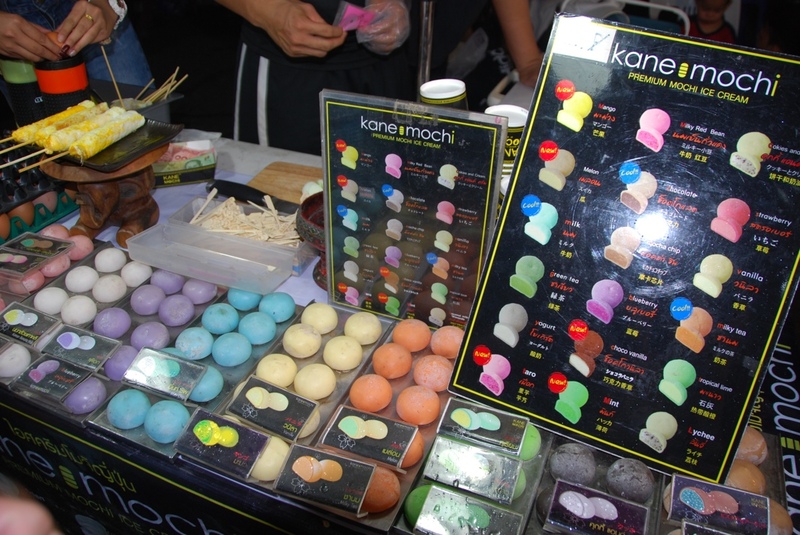 The name of this stall is kane mochi, which is a funny play on words because okane (oh-cah-nay) mochi means “rich.” I’ve never seen such colorful mochi ice cream and wild flavors before. Some were good and some were not so tasty. 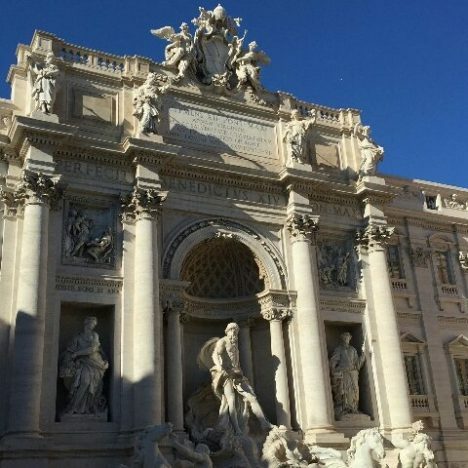 The next day was our free day to explore the city. We saw some temples, ate more food, did more shopping. It was a nice relaxing day to wander around. 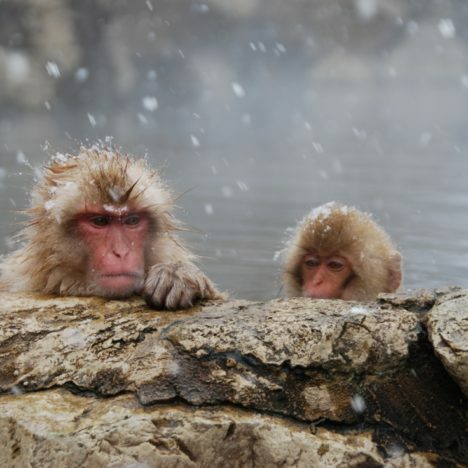 We will have about two relaxing days like this on our trip. 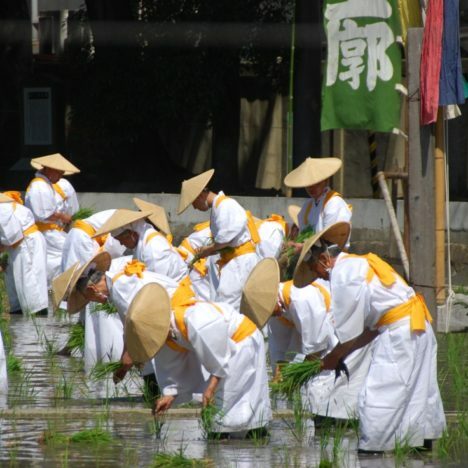 A lady came up to us at our first temple visit. 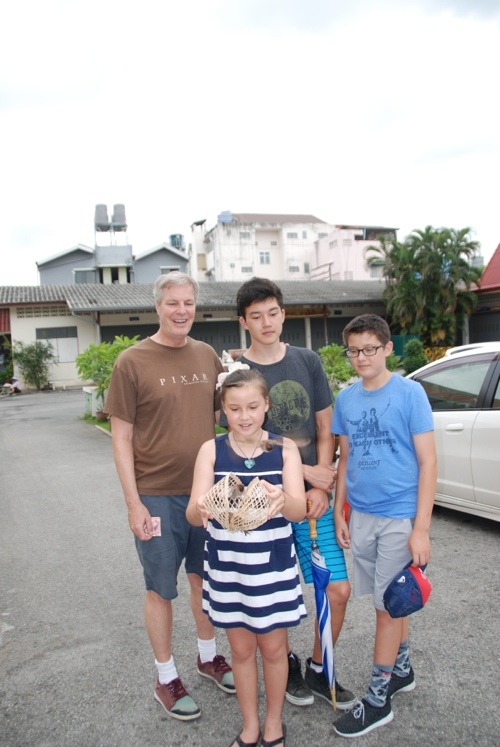 She wanted us to buy a basket of birds to release for 100 Thai bhat, which is about $3. She said it was for good wishes for our family. Okay, we couldn’t resist the prospect of good wishes. One thing I’ve been looking forward to is the food. I love Thai food that I’ve eaten in America and Japan so now I get to check its authenticity. 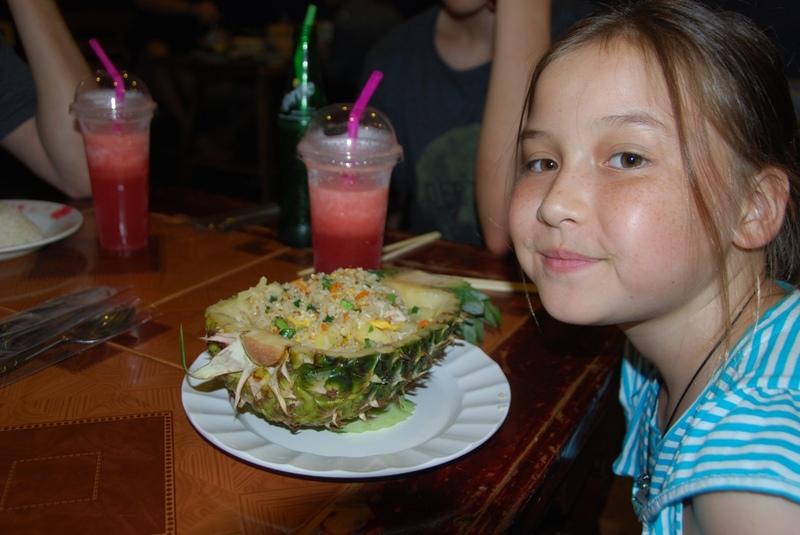 Avalon loved her pineapple fried rice, which came in a half pineapple! And being back in Southeast Asia means amazing fruit drinks again. We all ordered these large fresh watermelon smoothies and they were only 35 Thai bhat each = $1 (USD). 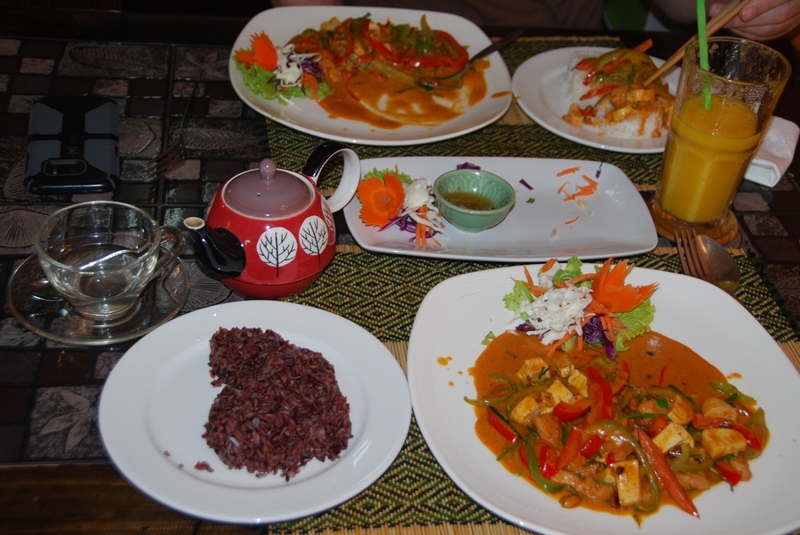 Chiang Mai is full of vegetarian and vegan options. Entire restaurants with vegan menus on a scale that I don’t know if I’ve even seen before. Maybe we were in the vegan section of town. It was amazing. John and I gave the kids money and they went off to a restaurant called Classic Burgers. 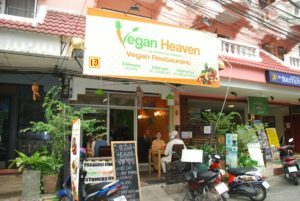 John and I went to Vegan Heaven. John loved his mango smoothie and I ordered ginger tea. My tea was just hot water and slices of raw ginger. Wow. It was delicious and I can do that at home. I would have never thought of that! My black rice is in the shape of a rabbit. It was something like brown rice but not as nutty. Val and Greg, we thought of you at the sight of all the vegan options! 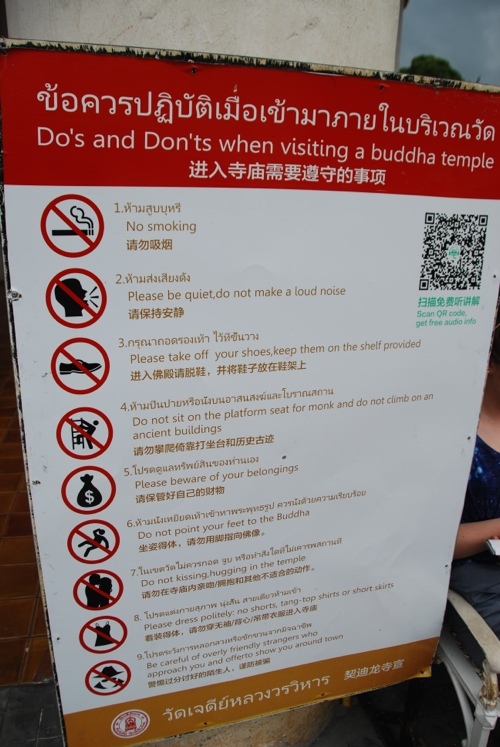 Here are “Do’s and Don’ts when visiting a buddha temple.” Thai people are VERY serious about Buddha. 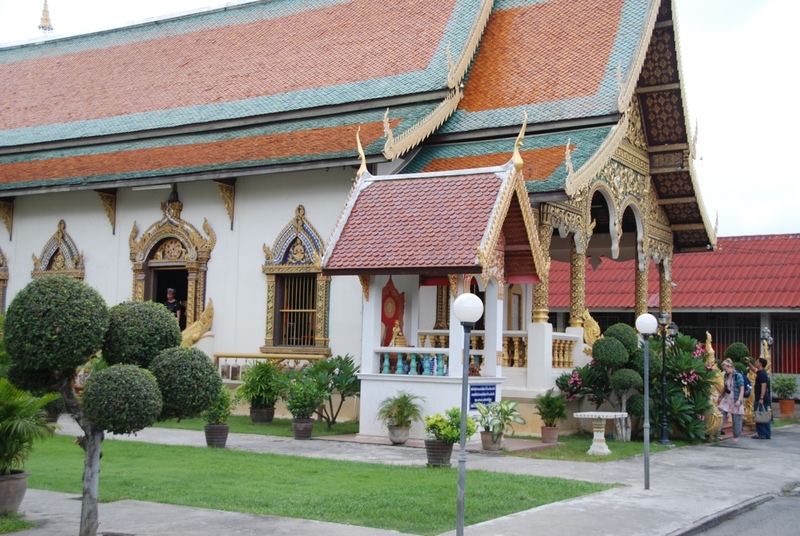 In fact, there are large billboards around town that say “Buddha is not for decoration.” They warn that buying/selling buddha goods and getting a buddha tattoo is punishable by law. Oh yes, this food looks right up our alley! Bring on the veggies. I am marking single photos to make prints for you and I am really noticing how much your kids grew from the start to the end of the 2 years.